Hi everyone! Welcome back to yet another riveting Junkers United, where 11 junkers gather ’round to show you what they’ve made out of… you guessed it… junk! If you’re new here, I’m Donna, a self proclaimed junkaholic and welcome to my little junk haunt where I share everything from rusty stuff, to things I rust myself. You can check out my work HERE and follow the rest of my social media links and email subscription options from the header, sidebar or at the bottom of each post. Today, I introduce to you… my new bedroom stepladder side table! This idea came out of need. I had a big, bulky side table in this spot, but as you can see, this is a tight space. So attempting to find something to chime in with the horsegate headboard, this full ladder did the trick! I cannot take credit for this original idea. I first saw one on Pretty Handy Girl using part of a ladder, and I guess the image never left my head. And now I have my own ‘restoration hardware’ toned version of one. 1. 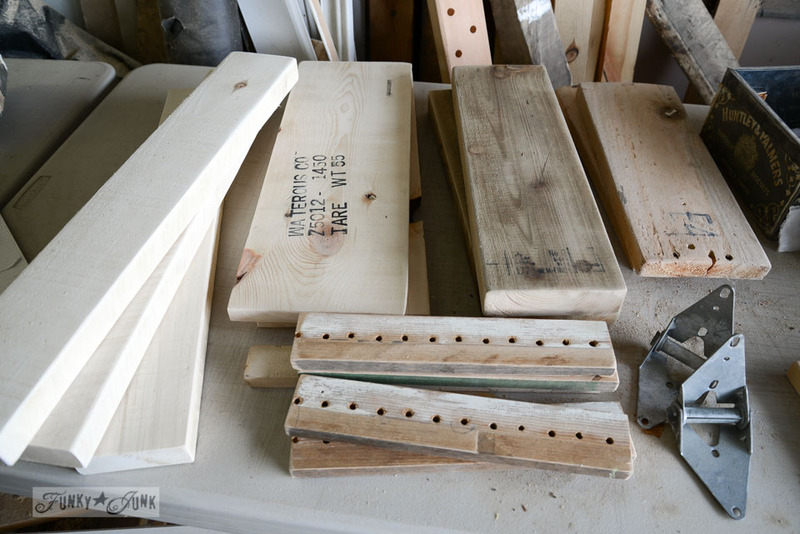 Select boards for shelves, wall supports, and something to connect the ladder to the wall. 2. Lean the full ladder against the wall at the desired angle. Attach ladder to the wall with top brackets. 3. Mark how long you desire the boards to be, then cut to size. 4. 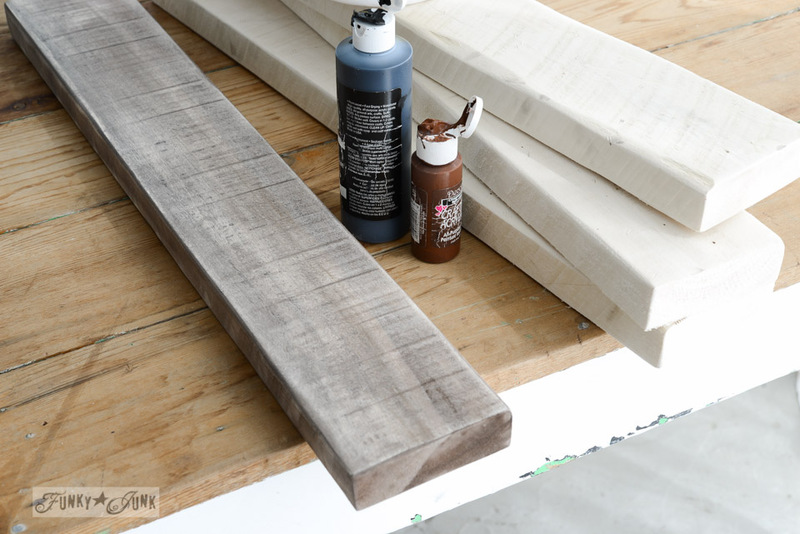 Stain the boards if desired. I used acrylic paint. 5. Place cut boards on each step, touching the wall. Draw a line with a pencil underneath the boards to mark where your supports will go. 7. Attach boards to steps by screwing underneath each step, so the screws don’t show. 8. Decorate, because you are now done! 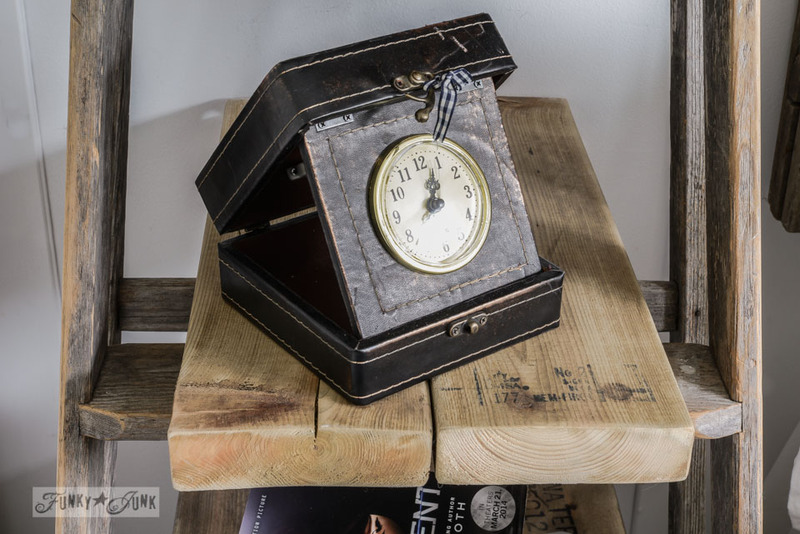 When I landed this adorable little clock in it’s own case at an antique mall, it HAD to come home with me. Battery run, it makes the quietest little tick tock at night. I thought it would bug me, but it ended up being very comforting. I love this little collection of old, faded Bibles. 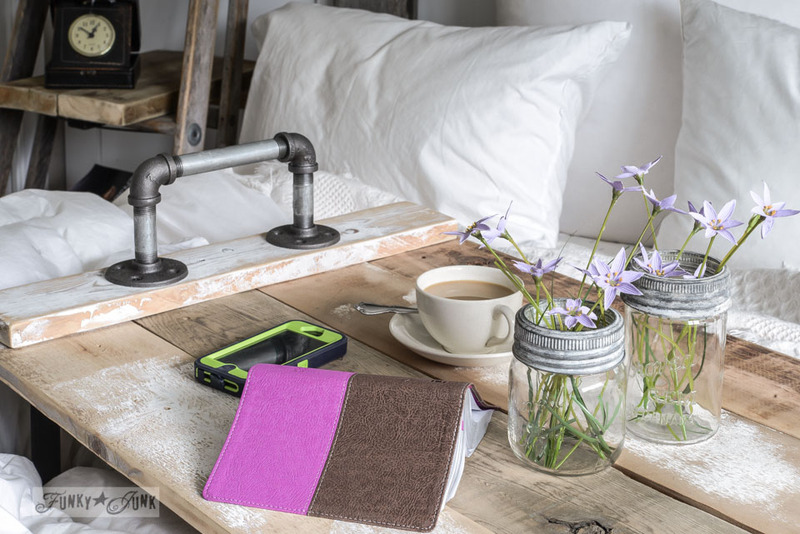 This junk styled jewelry holder is just a few pipes screwed together, weighted with the gear, and ending with the tap. The pipe handled reclaimed wood tray (tutorial HERE) is looking mighty happy beside it’s new friend. And you’re in for a treat! Check out all the other amazing NEW junk projects from the rest of the gang! We’d also love to see YOUR junk! Link up your favourite posts and we’ll pin highlights into one of the 4 boards shown below! Visit them regularly, we add daily! This is so pretty. Lots of storage too. Good job Donna! I absolutely Love your ladder side table! You are so creative! opening in some way or is that a sliding door? Absolute genius! Love the water faucet jewelry organizer….brilliant my friend. Thanks for the party! and thank you for the fabulous giveaway – how fantastic!!! Super duper job of accessorizing that ladder!!!!!! 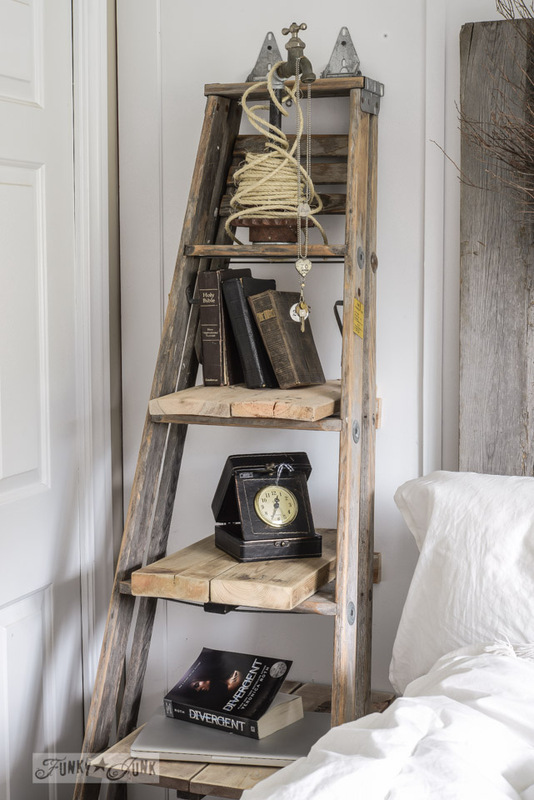 I have made ladder shelves–never would have thought about using one as a bedside table–genius!! Fabulous!!!! They remind me of loving your tool boxes when I first found your blog… my faves! hey there – I really like the way the room is coming together. All of the “distressed” wooden pieces are perfect! SOMEDAY I will come to visit and see it all in person! ps. my favorite part is the faucet!! I would love to use it for holding cutlery on my banquet table!!! I guess I’m getting rid of my boring bedside table, because now I NEED this! It looks amazing with all your vintage pieces on it! Amazing…as always! This is awesome!! I would use it on my desk for an organizer! I would love this! It would be great in the bathroom or craft room for storage…nice to put small terra cotta pots in…so many options!! Love it so much Donna – and that tray is one of my favorites. I always envy how your unmade bed looks elegant and mine always looks, well, unmade. Thanks so much for including me in this fun group! 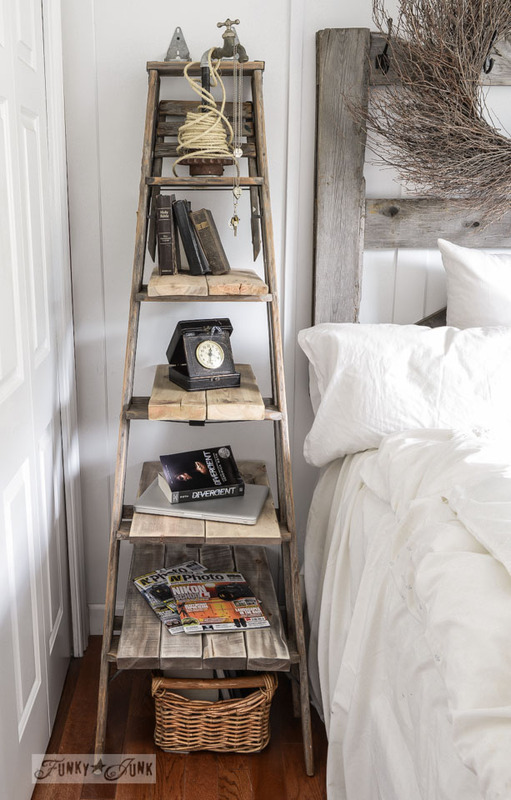 absolutely love your ladder bedside table!!! That is one gorgeous ladder / side table / display unit. I love it, and I adore your styling. I am always amazed at the cool stuff you have to finish off your projects. Wonderful project! Have loved your blog for a few years now, thanks for continuing to inspire me to use my junk!! I would love one of your toolboxes and think it would eventually be used in every room in the house, I like to switch it up often but I’m pretty sure she would start out in my kitchen holding all my teas:)!!!! Oh, fun giveaway, Donna! I’d probably use the toolkit to stage a vignette at first… and then maybe it would become a great organizational piece on my craft table! And love the stepladder side-table. Genius! 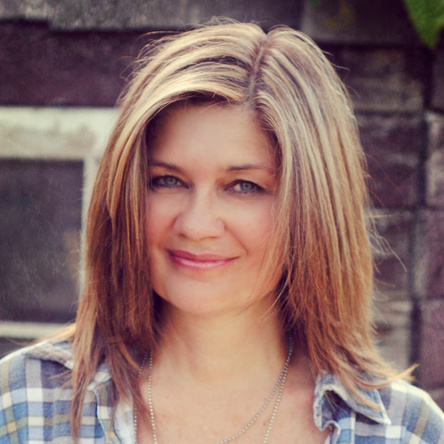 You are a junkin’ genius Donna! I love the wonky wood you chose, it’s just delightful! I would use it on my enclosed porch to store gardening tools! Such beautiful work! I think I’d add some mason jars and use the toolbox in my studio to store my paint brushes. I would love to have one of those great toolbox kits!! I’ve been following along when you made a bunch and took em to teach everyone how easy it was… I’d love to have one, it would be a great patio decor!! I would love to win a little toolbox and would use it for seasonal displays on my breakfast table…or maybe on my deck table…or maybe in my craft room! I can’t limit the possibilities! Thanks for the opportunity and I love your blog. Love this Donna! I need to locate an old ladder! Thanks for the inspiration! And i DO so want to make your tool box holder!! Okay…..about this toolbox…..I think it would make a great box next to the calendar…with pens, pencils, notepad, address book,etc. Then again in the bathroom to hold paper towels, soap, bath fizz, hand lotion, toothpaste,oh, I could go on for a while…..picnic basket with plates, utensils, tablecloth with weights…. I love the tool boxes and would so LOVE to win one!! farmhouse table hubby made me!! I just love the tool boxes. I picked up a flea market tool specifically for this purpose. Would love one of yours! I have the perfect place for a toolbox. I want to “junk up” my dining room to match my remodeled kitchen and with a few flowers in mason jars in the toolbox are just what I had in mind! I am making one of these…great! If my bedroom looked like this, I would never get out of bed! So calming and inviting! Stunning. I love all the projects you come up with. And your photography is beautiful. I miss the seasons. In South Texas we have summer and hotter than summer. However I will say that this past winter we got to wear our heavy jackets a couple of days. Even built a fire in the fireplace a couple of times. After following the Country Chic Cottage craft room tour all week I pulled everything out of “my room” and am reorganizing all “my stuff”. I bought a wood trellis to attach my metal window boxes to use for my ribbon and burlap covered cans for my scissors and other tools. If I’m lucky enough to win the toolbox, it will hold my burlap covered cans of tools, be put on the window shelf (another idea from the tour) right next to my work space, handy, dandy and good lookin’. This is great! I happen to have an old ladder I rescued in the garage with two old doors, Thank you for the inspiration. I would use my toolbox as a catch all for my sons supplements he now has laying all over my kitchen countertop. The faucet sends my lil junking noggin over the edge. How many people can say I saw an old faucet jewelry holder on a ladder shelf and I loved it? I love this project. I have a ladder just like it. Our bed is under the eaves though, but maybe I could do it elsewhere. Your bedroom always makes me want to crawl under those fluffy white covers and take a sweet nap! This would make a great organizer. Thank you so much for hosting the best party I’ve seen yet. Your ladder fabulous! Really cute, Donna! I made a similar shelf but painted it green and use it as a Christmas tree… My kids love it! I love your toolboxes! I would use it to take silverware and napkins outside for dinners. Or put glasses in each compartment to put fresh flowers. For minor repairs around the house. So useful love the old Bible’s. I’m doing this today ,thanks again love it! Love from Sunny Calif. It fits in so well with the other accents. Nicely done. I have a couple of old, smaller step ladders I use as plant stands and a side table, too. I always enjoy the linked up projects, too. 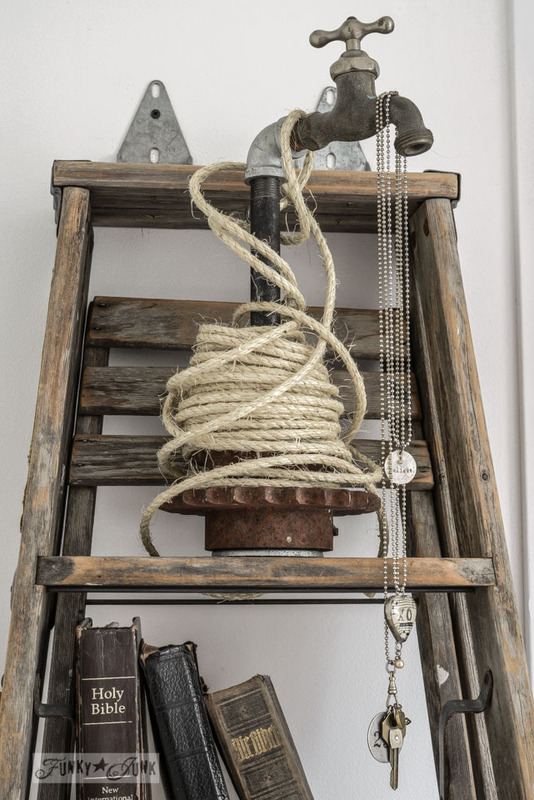 I love the faucet necklace holder on the stepladder that is a very cool idea! I love the ladder idea. If I won the toolbox I would use it for craft supplies. Is this in the right spot? Such a cute idea with the step ladder. We use to have one and my hubby threw it away before I could tell him I wanted it. Needless to say I was very disappointed. Love the tool boxes. I would use them for all my sewing supplies. I love it!! I have a little ladder around here somewhere that is really rickety. I might have to dig that out. I would use the toolkit as a carry all for bringing kitchen items outside for a bar-b-que…better than juggling! Love your stepladder shelving! Love your blog, Love your talent and ideas!!! You amaze me how you constantly come up with the most fabulous creations. I think I’ve seen my favorite and then you show us another unique design! I really think you should have a show! The ladder and tool boxes rock!!! Love this ladder! Looks so cute in your room! Love that pipe-handled tray, Donna! A centerpiece I can change out seasonal/holidays. Love the ladder side table!! Donna, I’m a widow and lucky enough to be retired. That said I just finished thoroughly going through each of the blogs in this feature. I went through each of them with a fine tooth comb, enjoying each and every spot I followed. Each and every blogger that contributed had such incredible value. I don’t remember how I found your blog, but it was one happy day that has led to so very many more. I know that comments should be short, and I’ve already made one about the subject matter, but I just had to thank you for the difference you have made in my life and I just wanted to take more of your time and thank you and give you a great big hug. Love the step ladder! Would love to use the toolbox in my jewelry studio. Your room looks amazing! I’ve always loved your headboard, but you’re right, it needed that ladder side table to finish it off perfectly. Ingenious (even if it isn’t your idea) and you have so much more storage now, too. I love the jewellery holder! lol What don’t I love about the ladder? I guess I commented too soon…but I would use the tool kit holder for my studio, probably to hold paint brushes and other painting tools. I really should make one, they look so easy to do and I have sooo much wood lying around waiting for me to get at. Love the toolbox. This would be perfect for my home. The ladder is gorgeous. Always love your projects. And I love your house decor! Love, love the versatility of the the tool box kit. I can see it in my bathroom holding towels soaps, sprays. You could use it as a table topper, put fresh plants or flowers in it. When dining outside use it to hold your paper goods. My craft room always need some organization . I love things that have multiple uses, it’s so creative! Love, love, LOVE it, Donna!Thank you for sharing! So inspirational! 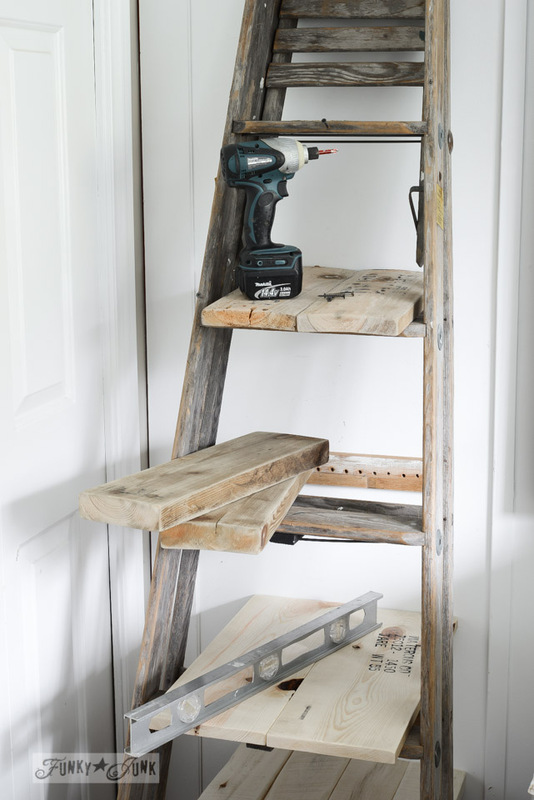 I have an old ladder I’ve been using and now I can “tweek” it to make it even more useful! Thanks again! I would love the adorable toolbox to store more junk of course! 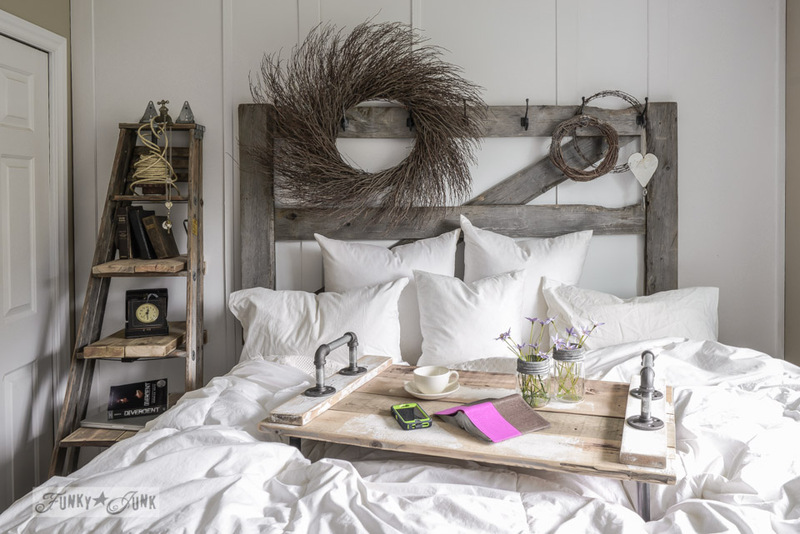 Wow Donna, I am always amazed at how you put together a room so gorgeously with Junk! Always a show stopper! I love these toolboxes. I think I would use it for accessories in my bathroom. 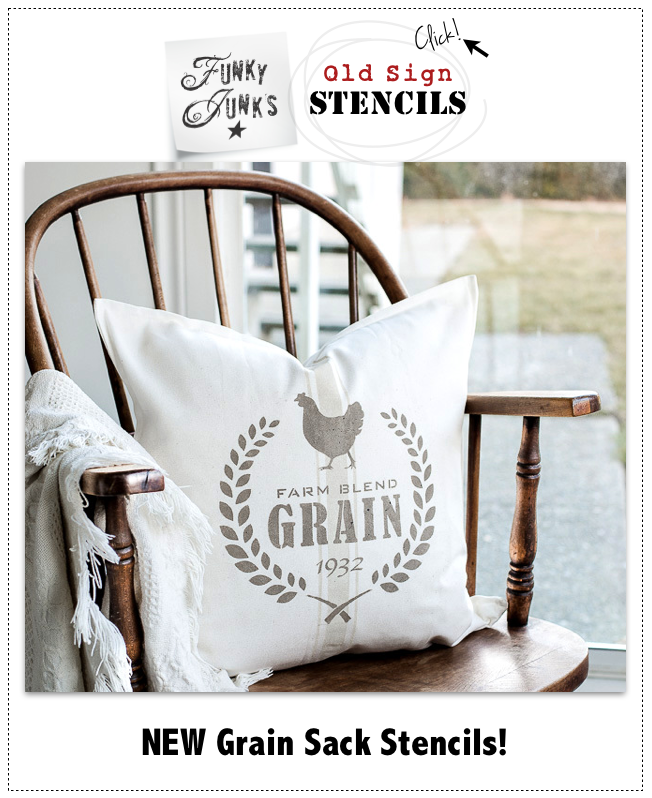 I am really looking to make my house a little more “rustic” and this would be such a great start! I’m thinking I would use it either in my craft room or even in my bathroom to hold little things! I live in the woods, so I think the tool box would be perfect for gardening!! 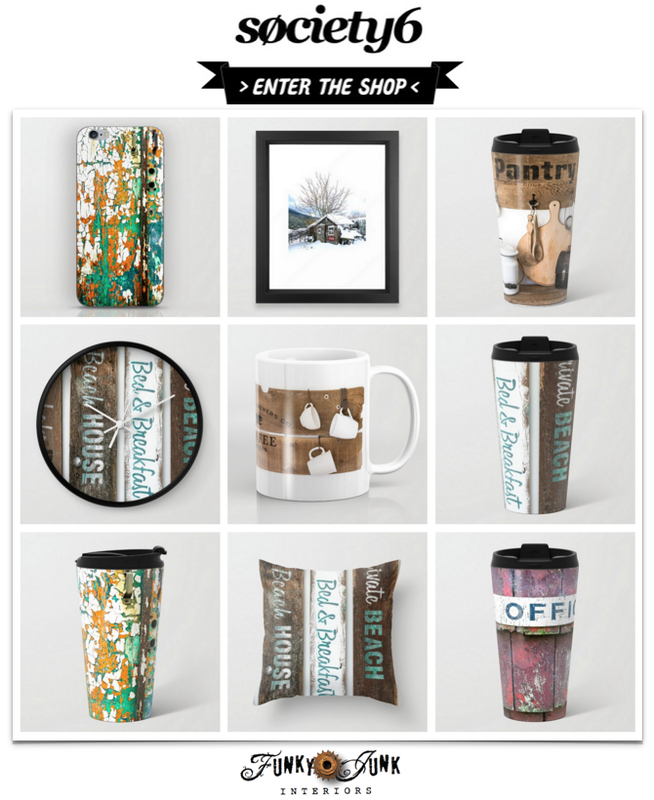 love your site and your style! 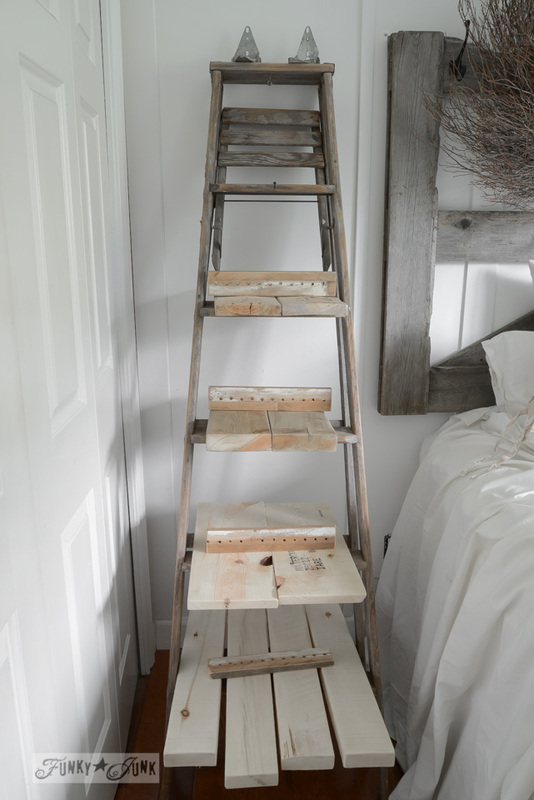 this ladder nightstand is so great – want to replicate! thanks for the idea. i luv your up-cycle & d.i.y. projects! i especially luv the found wood projects & easy to make instruction! i would line the wood ‘tool’ box and plant some yellow flowers to enjoy this summer. Great blog! Wow, so many uses! Would look great with a couple small plants, or in my craft room for brushes, scissors, hilighters etc. or in the kitchen for utensils, endless possibilities! I think my toolbox would make a great letter carrier in the front hall! Entry for toolbox kit. SOOO nice, I would use it for storage in my kitchen for utensils 🙂 ty! The ladder is great! As for the branch handled tool kit box, I’d use it in my booth display (josefinafineknits.etsy.com). It will make the perfect display for scarves and cards! You are so clever and thank you for the continual inspiration! The tool box is so neat! What a great idea! Blue mason jars and flowers from my garden would look great in one of these! Gorgeous as usual! You always find the best stuff!! These are such cute project ideas!! The ladder is great! Like storage options that go up, so I can have more stuff!! I love to repurpose things!! You’re tutorials are so easy to understand and follow. Thanks for posting this! I have an old ladder out in the garage that I don’t need but for some reason kept holding onto it. Now I know what I am going to do with it and where its going! This is great !!! I have a work bench in the garage and a big bucket for my traveling projects but I also have a small “in the house” tools catch all drawer and a spot on the floor in the spare bedroom that I have everyday tools just laying around. This awesome toolbox would be so perfect to keep them in I wouldn’t have to go room to room to find what I’m looking for !!! Plus it looks sooo cool! I would use the tool box kit to store odd toys in the living room. I’d love to win one of these boxes. I’d use a branch handled tool kit to store my many stamps and stamp pads! Thank you for this opportunity! groovy ideas thanks for sharing your creativity! i’d use that tool box,for numerous things,when i was tearing out stuff,id have my tools in it,painting,my paints in it,after a hard day of work, i think my homemade wine in canning jars,carried out to the deck,would work just fine! I love your creativity! I would use one of the tool boxes for keeping vegetable seed packets and garden tools organized. Can’t wait to see more of your ideas. I love this Donna! 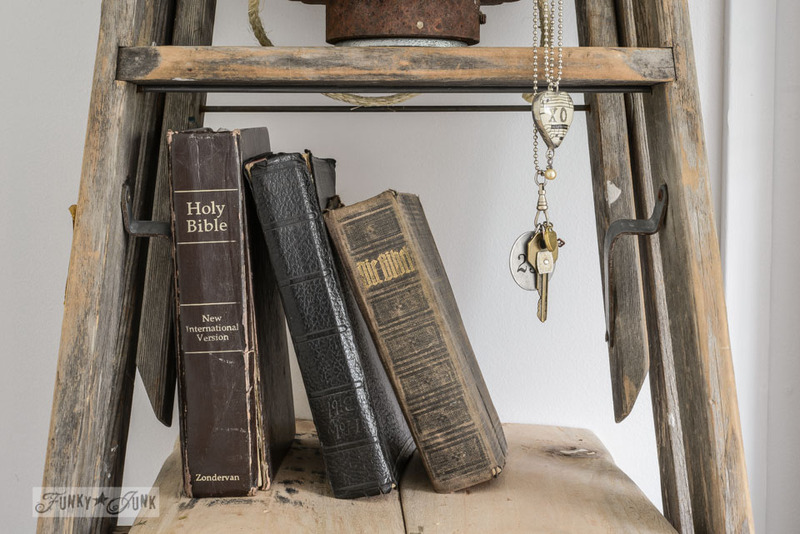 I am on the lookout for an old ladder now… pinned! Off to see if I have some projects to share too:) Thanks! Very cool look and functional! 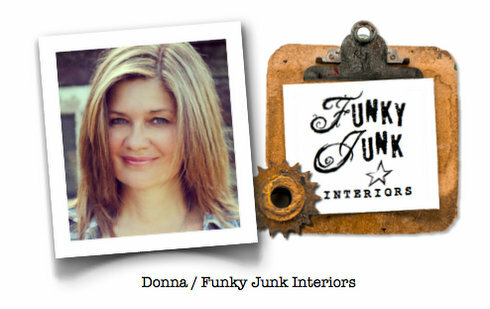 Love all your great & funky ideas/projects Donna! Would definitely use the toolbox to hold old mason jars with bright fresh flowers! Love it! Where do you find those gear things? I found mine at a welder’s yard. They aren’t easy to search out! I would use the toolbox to hold my mail! I would use the branch handled toolbox kit for a flower caddy. Use mason jars, pickle jars, tin cans, bottles or vases to hold the flowers. You could even use it to hold small potted plants or herbs. Oh wow !! It looks like a DREAM bed-and-breakfast !! So many talents .. you could open one of those too!! I would use it to hold my flat iron, brushes and other beauty products! That’s a wonderful idea Marie! I did this to a short ladder YEARS ago and it did work. Never thought to do it with this one! Thanks! I simply love your side table step ladder! With all the clutter that ends up on my side table a step ladder is just about what I would need to manage it all. I have just the right old ladder on my front porch waiting for just the right ides….thanks!!! Such a clever idea and it looks grand! Thanks for sharing! Looks beautiful! Did you have to cut off some of the height on the wall-side portion of the ladder? All the vintage painters ladders I see stick out very far and take up too much space, but affixing it to the wall would make me think the front half of the ladder would be off the ground and the shelves would be slanted? Let me know how you kept this even and so narrow in terms of floor space! So how do you open the bi-fold closet doors? One side of the closet is fine, the other is a little tight, however I don’t use that side anyway.